Have you ever looked at the weight charts in your doctor’s office and thought, “Are you kidding? 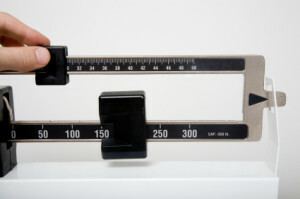 !” There are so many ways to calculate the “perfect” weight for you. There are numerous websites you can visit and various calculations you can follow. For instance, the Hamwi Method states that a woman should be 100 lbs for the first 5 ft and 5 lbs for every inch after. Huh? There is a Maximum Weight Limit (MWL) that states the max you should way is 125 for the first 5 ft and 4.5 lbs for every inch over. Better? Now remember, this is maximum. So really, what is your ideal weight? I say it’s the one where you feel good. The weight where you can look in the mirror and like what you see. The weight at which you feel strong, energetic and in control. It’s the weight where you can still live your life without constantly feeling deprived of all joy. You see, it is a fallacy to think we all need to be pixie-thinners to be healthy. Even a 5 – 10% weight loss will have substantial health benefits for those with high blood pressure, high cholesterol and Type II Diabetes. But let’s not be delusional and think you are at a perfect weight when you know your health is being compromised. Or stubbornly try to get back to your pre-college weight. The reality is, we all get a little heavier as we age. My sister likes to call it “nature’s facelift”. I just call it life. So find the middle ground. The place where you feel the most comfortable. The weight where you feel you are the best you can be.